You are here: Home » Featured » Sony Music Unlimited Sets Sights On U.S.
Sony Music Unlimited Sets Sights On U.S.
Sony has rallied support among the major labels—Warner Bros., Universal and EMI—to form a streaming music service that the partners hope will challenge Apple’s iTunes (now passed the 10 billion downloads mark) and give their artists an additional platform from which to be heard. Dubbed Music Unlimited Powered by Qriocity (sounds like- curiosity) the service opened last December in the U.K and Ireland and this past weekend (1/22) in France, Germany and Spain. It is expected to open for U.S. consumers first quarter 2011. Music Unlimited is available on Sony’s Playstation 3 game console, Blu-ray Disc player, Bravia televisions, personal computers, and will be on smartphones using Google Inc.’s Android operating systems. The new online cloud-based offering contains over six million songs and gives its major label partners more control over business model and revenue, without having to interact with additional entities. Users are required to pay for song access choosing either basic plan for 3.99 euros per month or the premium plan which costs 9.99 euros /month. 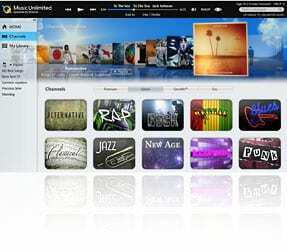 Unlike iTunes which allows users to enjoy their song files offline, Music Unlimited users must be connected for the files to stream. The Sony site also has no plans to offer free content or ad supported only content. “Free doesn’t make any money,” said Thomas Hesse, head of digital operations and corporate strategy Sony Music Entertainment. Analysis: The corpses from a number of streaming and download services lie strewn about the digital highway such as LaLa, the original Napster and many more. Others, like Spotify, have been rumored to reach the U.S. but not yet arrived. However, Sony’s size and its installed hardware user base gives Music Unlimited added market clout—the company expects to have about 350 million devices in the marketplace over the next few years. However, it appears that users have to be connected to listen to the songs they have purchased. In the future that should not be a problem as wireless connectivity seeps further into our world’s infrastructure. However, at this time, there are many areas even inside major cities nicknamed “dead zones” where the signal is not robust, and this may slow adoption of a streaming only model.